Two men wanted in connection with sexual assault of woman in Hatfield Township on June 8, 2017. 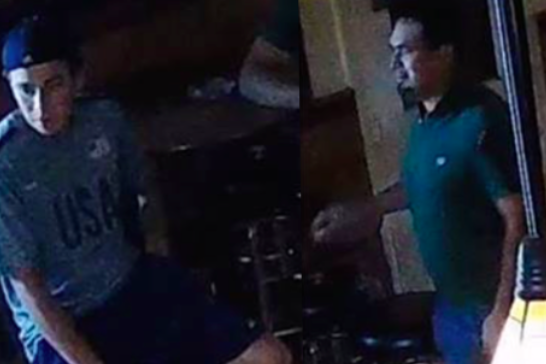 Authorities in Hatfield Township are seeking assistance from the public to identify two men they would like to question about the sexual assault of a woman as she walked home from a bar late last week. Investigators said the incident occurred during the early morning hours last Friday. The adult victim was walking home from an establishment in Hatfield when she was approached and assaulted by a man in the area of East Vine and Berry Streets. Police provided photos of two men they want to question. Both men were at the same establishment as the victim prior to the assault and have been labeled persons of interest, according to police. Officials did not disclose the name of the bar where the men were pictured. Anyone who can identify the men or has information that can assist the investigation is asked to contact the Hatfield Township Police Detective Division at 215-855-0903.